This week’s #WeBlogSummer theme is Summer Holidays. Something everyone looks forward to. Whether we are going away or staying in the UK, we all seem to run outside and cherish the week of sunshine that we’re going to get (if we’re lucky!). Something that should be at the forefront of everyone’s mind during the summer holidays is protecting yourself from UV rays. Why? well, because skin cancer is the most common cancer in the UK. A quick Google search will tell you just how scary skin cancer is. Luckily, Smartsun UK may have just invented something that could help us Britons be more conscious of harmful UV rays. Smartsun UK have bought out an innovative new idea which will hopefully change the way we enjoy the sunshine throughout the summer holidays. 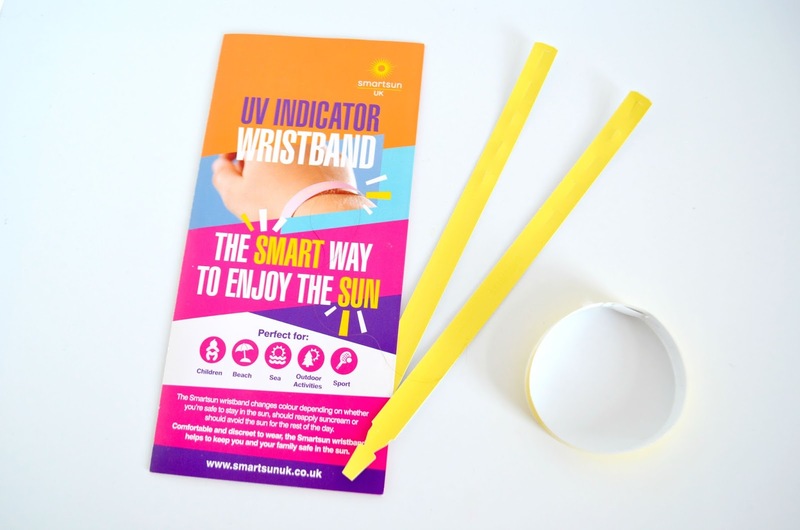 The brand have created an easy to wear UV indicator wristband that is put on after you’ve applied a good high quality sunscreen. The wristband uses a colour coding system to tell you whether it is safe to be outside in the sun. The wristband is both discreet and comfortable to wear and honestly you can barely feel it on. The leaflet that they provide with the wristbands explain just how simple it is to use. To put it on, you loop the end through the hole provided, with the yellow side facing outwards. Once it’s on you don’t need to do anything else. The wristband will work it’s magic and as the day goes on, it will slowly change colour. When the wristband is a bright yellow, you’re fine to be out in the sun. The leaflet explains that when the wristband turns beige it’s a sign that you need to reapply suncream. I must admit, I’m slightly pedantic about things like this. If it says beige, I’m looking for an actual beige but after wearing my wristband the whole day last week, I realised that the bright yellow colour just seems to fade, so it’s more of a light yellow than a beige. After running around on a city farm in the heat all day, by the time it hit mid afternoon, I look down at my wrist and noticed the colour beginning to change to pink. The sun was at it’s hottest and it was a definite sign that I needed to get out of the sun and keep safe. Overall, I think this is a brilliant invention, in fact everyone should have them! A huge thank you toSmartsun UK for sending me some UV wristbands to review. They’re ideal if you’re a parent and your children love the outdoors. It’s nice too because children are able to see the colour change and judge for themselves when it’s time to come back inside or reapply sun cream. I love that they hardly weigh anything so you can keep a handful of these in your bag and put them on if ever you’re going to spend your day outside. I can definitely see everyone using these every summer and on their holidays in the very near future! What do you think of this handy product?